À jour (from French: jour = day) is a term used in gem setting to describe open worked backgrounds, created by sawing or piercing, that keep the stone back open “to the day.” This opening allows more light to enter the gem, thereby enhancing its scintillation and color, making it appear more lively. À jour settings for gemstones set in fine jewelry became popular around 1800. Prior to that time, most gems were mounted in closed back settings. Fine à jour work is accomplished by the use of a graver to refine and create well-formed openings on the reverse of a jewelry item. 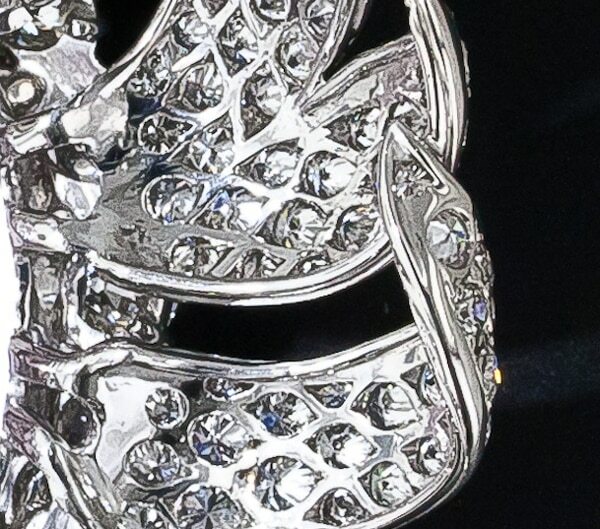 Art Deco jewelry customarily features à jour work that makes the back of the piece almost as beautiful as the front. In enameling the term plique à jour is used to describe an item with an open background which is filled with transparent enamel. This creates a myriad of colors when held to the light. 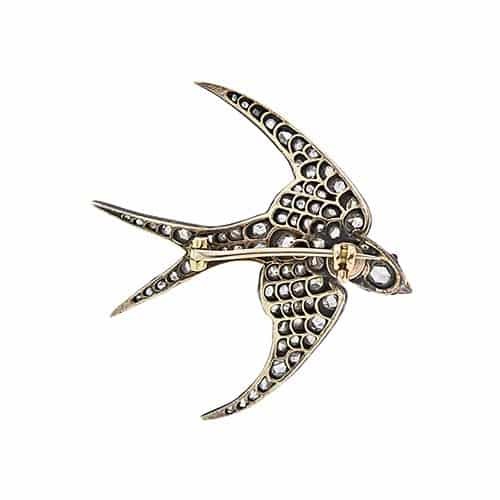 Reverse – Victorian Diamond Swallow Pin Demonstrating À jour. Close-Up of À jour on Brooch Reverse. Note the Navette-Shaped Openings Cut to Accommodate Each Diamond’s Pavilion.